25752296 - When deploying a Rule Set that contains rule sets, it may return an error.. In the MOS | Patches & Updates screen for Hyperion Calculation Manager Patch 25775528, click the "Start a Discussion" or "Reply to Discussion", and submit your review. One of the treats of working in the Business Intelligence world is that we are asked to analyze different aspects of a business. In fact, we are asked to analyze many different types of businesses, too. Most of us using BI tools have come from some previous background. Be it Marketing, Finance, Supply Chain or any other, we most likely had work experience before we got here. Maybe one of our jobs even led to Business Intelligence. The fact is, we are not experts in all areas. It would take several lives to make such a claim, because each area can be very complex and take years to master. The truth, for most of us, is that we have our favorite areas. They are often related to what we are most familiar with. 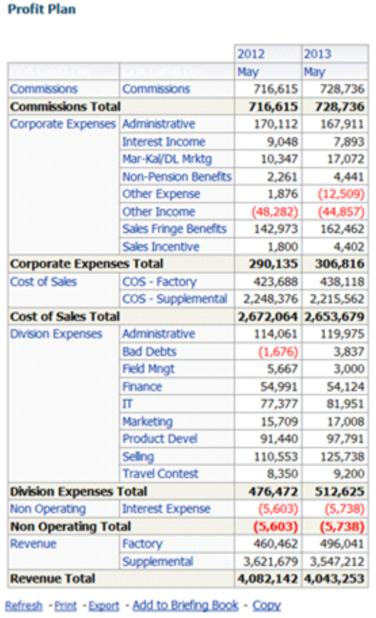 Over time, I came to really appreciate how simple numbers can be, and developed this - hard to understand - favoritism towards financial reports. While some business areas can be artistic and even vague, numbers are never vague. I have a great appreciation for that. Working with numbers is always precise. In the end, they have to match. No matter how great your report looks, if the numbers don’t add up the report is always wrong. Plus, financial layouts are generally very defined going in, so there is little room for error. So, the endeavor begins when you are a BI consultant and everything is supposed to add up properly and look very nice. 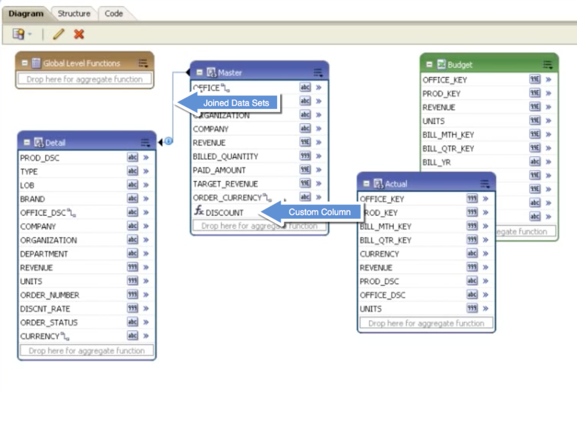 OBIEE is an extremely powerful tool, and this gives users the impression that it can solve all problems. While it can solve most problems, it falls short on some key features needed for easy financial reporting. 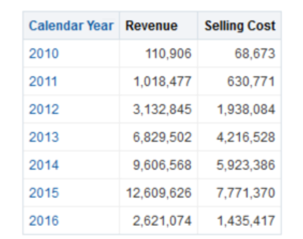 That is not to say that Financials can’t be handled in OBIEE - but it is definitely to say that it is not easy. I have made the mistake of choosing option 1 some times, but quickly realized that option 2 couldn’t be as bad. 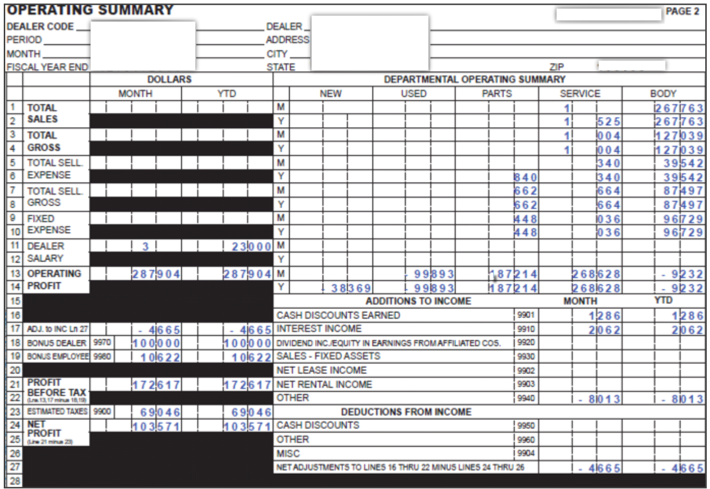 Countless times, I have been asked to create financial reports in OBIEE. Of course, they needed to tie up and match a specific format: they needed to have blank lines inserted between one section and another, and the alignment of the categories was very important. They often required very detailed variance calculations, so that a company could see where they stood as far as change overtime. Variance percentages are key on these types of reports, and if you have dealt with them in OBIEE, you know that different types of variances and their grand totals can often pose challenges for report writers. 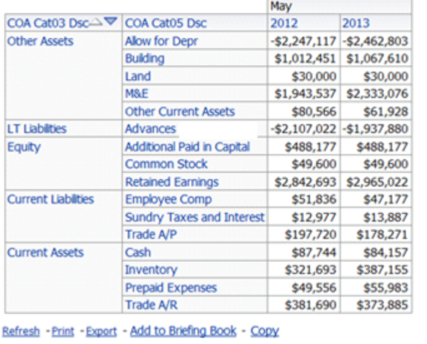 ** The Balance Sheet above was created using HFR for illustration of formatting only. 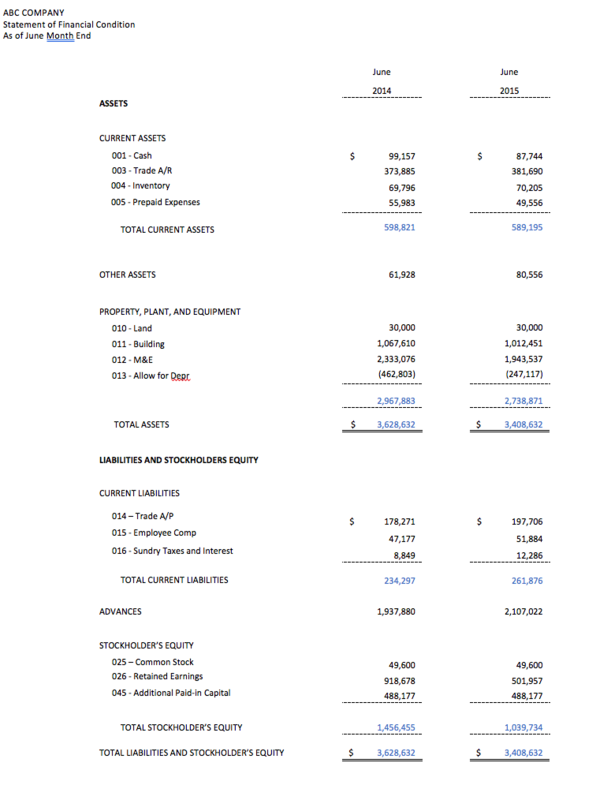 Looking at a different OBIEE financial report (below), you will see that a lot of formatting can be done in these reports, but they will always look like OBIEE reports, if you know what I mean. And now, you will be able to see your measures as rows. You can easily reorder them as needed by just moving the order of the columns in the Measures section of your Layout editor. 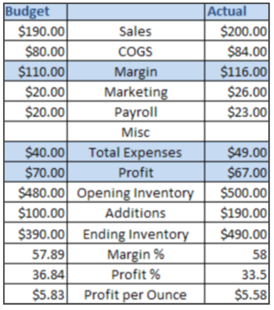 This is a great improvement, but you will still need to deal with an overall lack of flexibility for dynamically adding and deleting columns, setting orders, adding blank space, indenting and calculating variances along with proper grand totals. After spending more time than you should in order to create a simple report, you really start considering other tools. 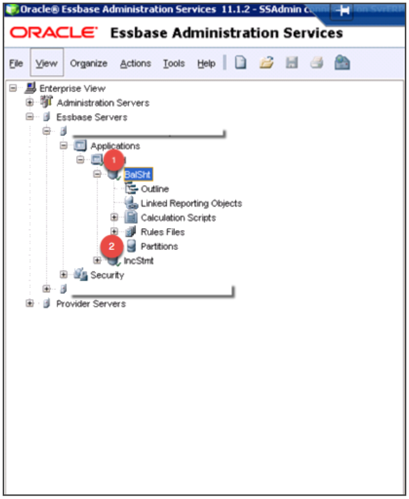 If you are already working in the Oracle stack, the obvious choices will be BI Publisher and Hyperion Financial Reporting (HFR). Hyperion Financial Reporting (HFR) brings a powerful solution to financial statements, because it allows you to create pixel perfect reports that are pre-aggregated in an Essbase cube. Just with that, two big problems were just solved: formatting and performance. The challenge here is that you may end up with multiple layout grids on your HFR report, which will complicate the report creation and maintenance going forward. It is important to know that if your requirements call for strange off-setting of cells and multiple different looking blocks, then HFR may not be the best tool for the job. If you choose HFR for this purpose, you will spend too much time trying to make things right. 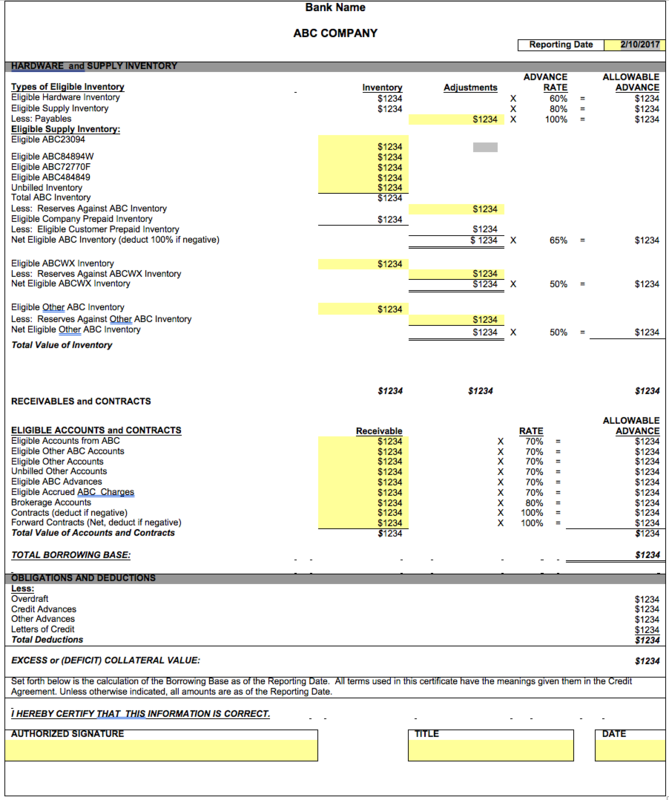 *This is a simple Essbase implementation with 2 cubes (or databases): a Balance Sheet and an Income Statement cube. The fact is, some financial reports are very tricky and do not come solely from a Financial module. For example, if your company is evaluated monthly for a line of credit, your bank may require to look at several components of your business in order to determine the amount that you can borrow. They will base their decision not only on your monthly revenue, but also your liabilities, such as accounts payables, and some of your assets, such as inventory. What they ask for really depends on their internal lending requirements, and also on the type of business that you have. 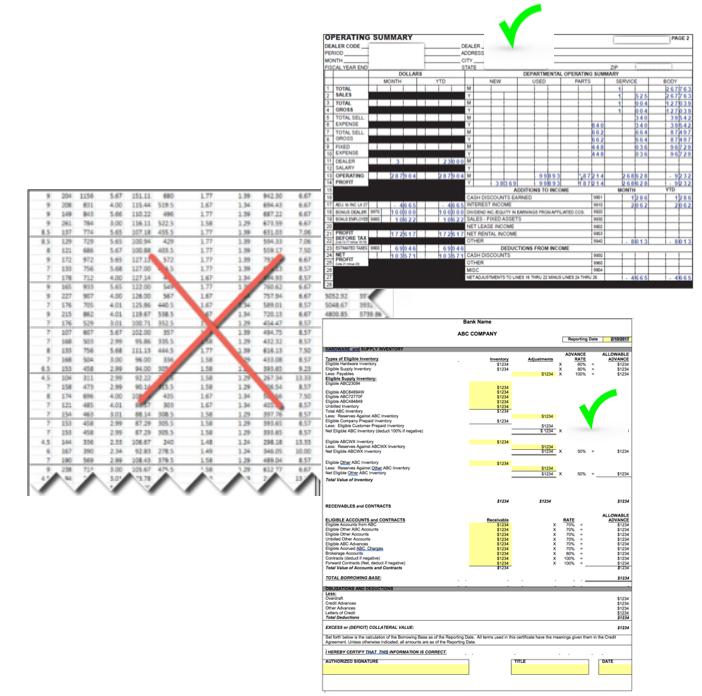 These are, therefore, highly customized reports that never come out-of-the box anywhere. For this reason, most companies spend a lot of man hours creating these reports as a huge excel report, after the employees have managed to pull information from many different modules together. 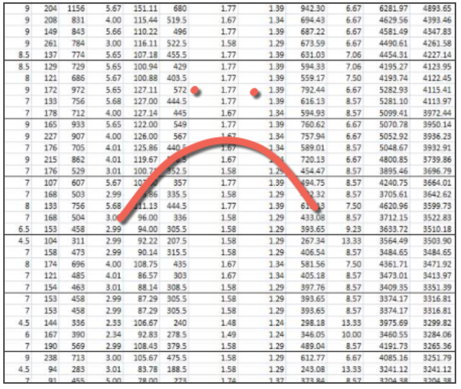 These excel “monsters” do the job. They are accepted by the banks, and will get you that loan. On the downside, they need to be redone every month and will drag resource hours out of profitable projects. 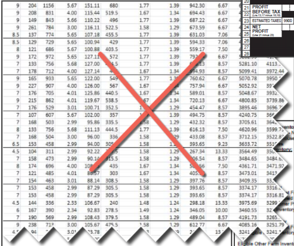 The flat excel files are also prone to mistakes, as the values are manually keyed in each time. If you make a mistake favorable to the company, your bank will look at it as a very negative issue. If you make an unfavorable mistake, you will not be able to borrow as much as you qualify for. This is a no win situation, so the reports must be accurate every time. To check for accuracy, there is nothing like testing overtime. But, since you must rework the report each month, you don’t have that opportunity. The solution is to create a template that will pull from all of these different modules, calculate the numbers, add the results automatically to a pixel perfect formatted report. Over the development cycle, these mappings and calculations will be thoroughly tested, and then they will only be reused going forward. While you may spend some time pulling this logic together, you will only have to click a few buttons after you are done, for months or years to come. In fact, I have clients that have been running reports such as this one for years. They have been saving a couple of weeks in report creation every month. On this report, each number (disguised as $1234) has been mapped to a calculation that will be pulled dynamically, according to the date entered on the prompt. The inventory amounts are adjusted according to banking requirements, and a rate is allocated depending on the row. This amount is later added/subtracted from receivables and existing contracts. Most of these numbers were created as separate OBIEE analyses. Some amounts could even be tied into web services to get the daily futures prices to estimate the value of contracts when the report runs. All lines are considered in the final equation before the total borrowing amount can be calculated. Per this bank’s requirement, this form needed to be printed and signed, then submitted monthly. Lending/financing reports may be the most tricky, and the most time consuming for companies to generate every month. The reports may be required by the bank, or by a company that is leasing or financing valuable equipment to your company. 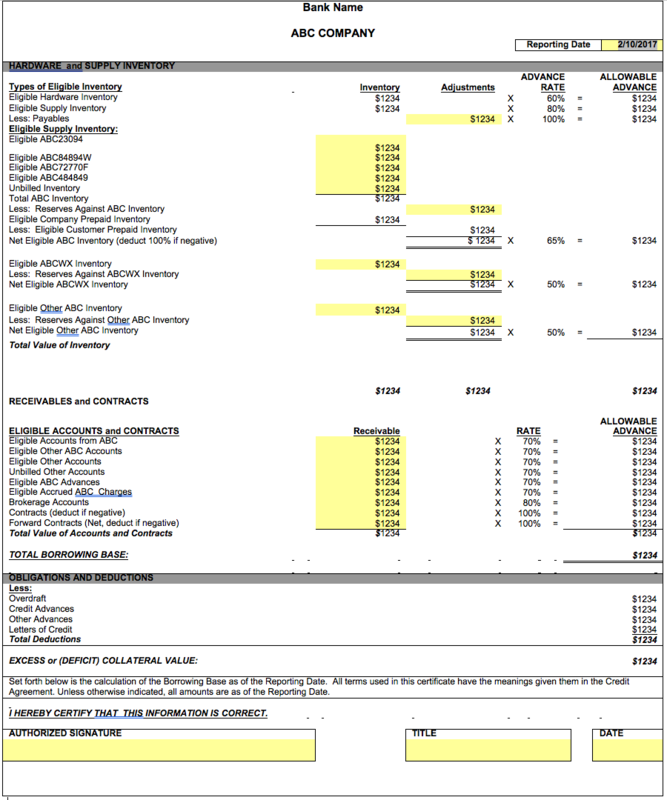 These reports need to show your prospective lender everything about your business. They will often need to be done in a format that is specified by your lender. These formats are not negotiable, in fact, some lenders still use old forms that used to be read by a machine. Well, as I mentioned in the beginning of this article, OBIEE would not be your partner in this type of endeavor. I can guarantee that this relationship would fail: strange formatting with black boxes, line numbers, need for Headers (footers too, not shown here), indenting, etc. Performance does not tend to be an issue with these reports, as they are generally submitted to lenders on a monthly basis, and therefore can be scheduled to run automatically in the middle of the night. As mentioned earlier, HFR requires a layout grid to be inserted before the report can be designed. Here, you would end up with multiple grids to handle the calculation of different cells from multiple cubes - which can be cumbersome to create and maintain. The measures in an HFR report should come from the pre-aggregated cube. In this example, some of the measures were entered as part of the prompt and are calculated at run time. At this point, you must scratch the Essbase/HFR option for this one! So, now you are still stuck with your monster excel spreadsheet, then retyping the numbers onto the required form. 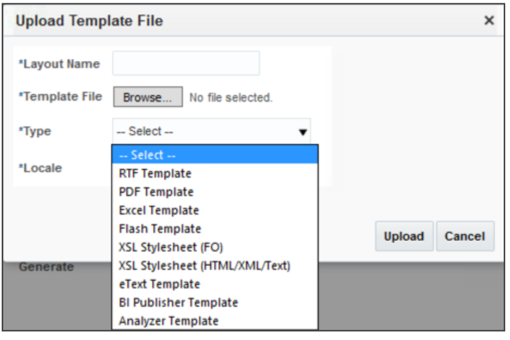 Before you marry this solution, let me present you with the tool that can do everything: BI Publisher. Stay tuned for the second part of this blog, when I will share why I believe that BIP can solve the most challenging reporting requirements out there! Note: Essbase Administration Services 11.1.2.4.015, Provider Services 11.1.2.4.015, and Essbase Studio 11.1.2.4.014 are supported for use with Essbase 11.1.2.4.015. The following Patch Set Update (PSU) has been released for Hyperion Profitability and Cost Management (HPCM) 11.1.2.4.x. Check My Oracle Support for the latest patches. Be sure to upgrade all components included in each patch. • 24653959 - Submitted jobs could take up to a minute to display with correct status in the Job Library. With this patch, submitted jobs display immediately in the Job Library and their statuses are updated promptly. • 25070783 - For Management Ledger applications, dimension cache loading is enhanced in this patch to load more efficiently. For applications with large dimensions, this results in much shorter wait times for accessing dimension members after updating dimensions. • 25219342 - For Management Ledger applications with large dimensions, Smart View queries could take too long to validate and save, causing the screen to hang or time out. That problem is resolved in this patch. • 25263275 - For Management Ledger applications, member formulas with new line characters cannot be supported. 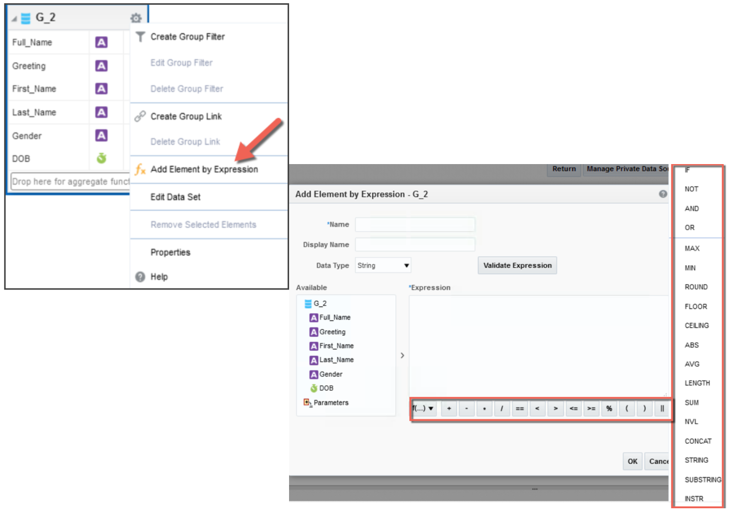 They cannot be properly imported by Template Import or LCM Import.Template Export and LCM Export are enhanced in this patch to remove any new line characters within member formulas so they will be able to re-import cleanly without errors. 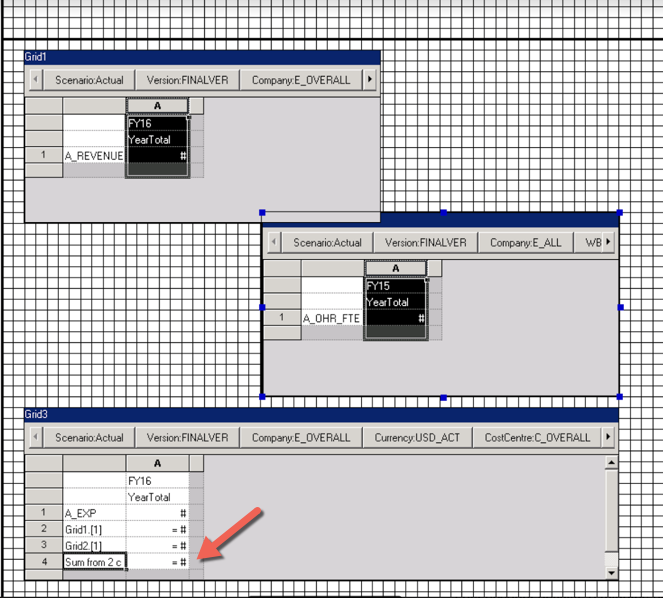 • 25340413 - For Management Ledger applications with attribute dimensions, the attribute associations were not being imported on the base dimensions when Dimensions were selected for LCM import.With this patch, LCM export is changed to export the attribute dimensions first so they will import before the base dimensions. If you have encountered this problem, re-export your application after applying this patch, then the attribute associations will import correctly. If the source application is no longer available for re-exporting, the workaround is to re-import the base dimensions after the initial full import. Documentation provided from the Oracle Help Center for Oracle Hyperion Profitability and Cost Management 11.1.2.4.120 is the most up-to-date documentation available for this product. Prior to proceeding with this PSU implementation refer to the Readme file for important information. In addition to details of the New Features and full list of the defects fixed, the Readme file contains important support information that includes prerequisites, install details for applying patch, post-installation instructions, and tips & troubleshooting information. It is important to verify that the requirements and support paths for this patch are met as outlined within the Readme file. The Readme file is available from the Patches & Updates download screen. In the MOS | Patches & Updates screen for HPCM Patch 25211863, and click the "Start a Discussion" and submit your review.